Reading and Writing Redhead: Classroom Friendly Pencil Sharpener Giveaway! Everyone! I lucked out and the owner of Classroom Friendly Supplies, the maker of the quietest pencil sharpener ever, agreed to donate one to a lucky winner of this giveaway! Look around the internet and you will find many, many people raving about this sharpener. It is manual, but quiet. It is sturdy and dependable. It sharpens pencils to a long, sturdy point and does colored pencils too. It also has a great auto stop on it. It won't disrupt your lesson like those electric sharpeners and I am sure you and your kiddos will love it! Head over to Classroom Friendly Supplies to take a closer look. The Giveaway starts April 11 (tonight) at midnight and runs until April 18 ! There are a bunch of ways to enter the giveaway. Take a look at the rafflecopter and decide which ones you'd like to try! I really really want one of these. So excited!! Firehouse Red! I really want one of these! How do you tell which number follower you are at your store or on google? I usually look to see how many followers they have before I click it and then say the next number up. For this, you can just type I'm not sure if you don't know. No worries! Thanks for stopping by! I would choose a blue one! I'd love one in red. I'd love the blue one. I have tried to win one of these for a while now. I spent $140.00 from a vendor for a really good sharpener but the students are not allowed to sharpen themselves. I swear that I have little beavers in my classroom with the way they go through pencils. This would be a great sharpener for them to use. I will continue entering these giveaways, and if I an not lucky enough to win, I plan on ordering the RED one from my classroom budget for next. year. Red is a powerful color, so I hope that I win. Jeanne, your anecdote is so cute. I am just picture little beavers chewing away at pencils. That would a good idea for a clip art picture! Thanks for stopping by! I would love a pencil sharpener! I think the black one looks awesome. Thanks for the opportunity to win one of these. Love your fraction page! and I would say blue one. have a beautiful weekend teachers! I would like to have blue if I win. Would love to have the blue one! I would love the the red one! I'd love one in blue! 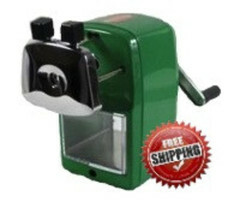 I have entered to win this sharpener many times!! I hope I am lucky this time! Thank you for the opportunity! Hhhmmm. Have they made a purple one yet? I SO want a purple one! If I won I'd take a black one! I'd love a blue one! Blue! Thanks for a great giveaway.